Who Brews Norman, Brian & Randy Daniels? On an early exploratory brewery and bar tour of Sydney, back before The Crafty Pint was launched, the places in which you could find a decent selection of craft beer were few and far between. One of the lone outposts was also somewhat unexpected. Yulli's was (and still is) a 100 percent vegetarian restaurant in Surry Hills. At the time, it only had a small number of taps, but what was pouring through them was worth drinking, while the fridges at the rear contained a decent selection of locally sourced craft beer too, which could be enjoyed not just with veggie food but in the company by sweet tunes too. Today, with many areas of Sydney catching up to where restaurant owner Karl Cooney was many moons ago, Yulli's craftiness continues to grow – and not just in terms of a bigger range on offer at its Surry Hills home. 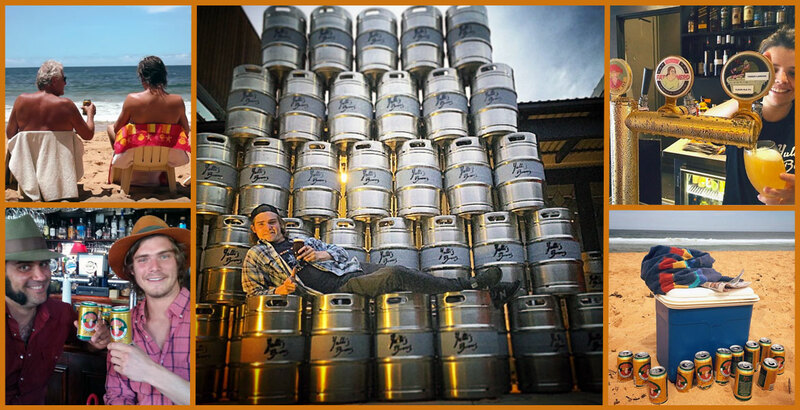 Back in September 2014, Karl and home brewing staff member James "Harvs" Harvey (pictured in front of the kegs above) launched Yulli's Brews. Since then, they've created a wide array of beers adorned with entertaining cartoon characters while operating as the most gypsy of gypsy brewers, have collaborated with friends, and have just had a first beer popped into cans in the form of Norman, the fruity Australian Ale you can see showcased in their new short promo film, poking a little fun at the crafty landscape they inhabit, below. Where do you brew? Happy Goblin Brewery, Wayward Brewery, HopDog BeerWorks, ICON Brewing, St Peter's Brewery, Blackrock Brewhouse and Brewpack. We brew for the love of creating something that people can enjoy. Not only creating a flavoursome ale or lager that is damn tasty, but something that is associated with good times and social experiences really makes the whole process so fulfilling for us. Absolutely! Firstly, getting a leg up from the boys at the Grifter a few years back really accelerated my practical brewing knowledge in a big way. And then I guess when I won the Vic on the Park homebrew competition in 2014 it really gave me and my business partner Karl and I the confidence to know that my beers were actually pretty decent and it might be worth having a crack at it! Our beers are mostly sold throughout inner Sydney, in particularly the Inner West, the Eastern Suburbs, and a little bit on the North Shore. We have our beers available at a few venues throughout Brisbane and Byron Bay, as Karl lives up that way and has begun distributing himself up there. We also have our Norman cans now available in Cairns and Port Douglas in North Queensland, with the help of some amazing family who have assisted in distributing the tins. Yulli's Brews began with Karl and I fantasising about one day owning our own brewing company, whilst eating falafel rolls on lunch breaks at Yulli's. We spitballed (kind of joking) for years, until I won the homebrew comp and thought hang on... let's have a crack. Karl and I developed our whole business at Yulli's, and Karl still owns and operates it, whilst I still work there whenI'm not making or selling beer, so it only felt natural to tie it all in with where it began. It also gives us a bit of a home base for the brews too! A keg of homebrew American pale ale, an EKIM Berserker, a coupla Norm tins, and some Coopers green bottles. Firstly we'd hope to have a brewery by then! Location is still undecided, but ideally somewhere up the coast away from the hustle and bustle of the city. National distribution is something that would be a long term goal we'd love to aim for. Obviously, it's a long way off but we feel our organic growth to date is promising for whatever lies ahead for us. We'd also love to have a range of our beers available in cans. It's only been a little over a month or so since our Norman cans came out and the response has been fantastic, so we'd love to be able to offer a full range in the tins. You can check out other Who Brews? 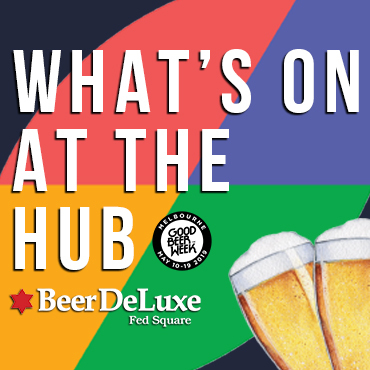 features on breweries here. 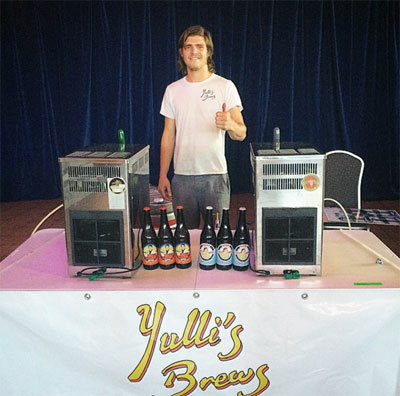 And keep tabs on all things Yulli's Brews via their Facebook page. Who Brews Himmel Hünd Wit?